National law enforcement and Transportation Department officials released figures this month that show the number of women drivers arrested for driving drunk has increased dramatically over the last decade. From 1998 to 2007, the number of women drivers arrested for driving while under the influence increased by nearly 30%, according to the U.S. Department of Transportation. Each year, approximately 2,000 traffic fatalities involve women drivers. 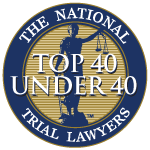 The subject has recently been brought to attention after a tragic accident in Westchester County, New York, involving a female driver whose blood alcohol content was found to be 0.19 at the time of the crash, more than twice the legal limit of .08. The woman, who was killed in the crash along with her 2-year-old daughter, three young nieces and three men in the vehicle she smashed into, was also found to have smoked marijuana no more than an hour before the horrific crash. Despite the new trend, drunken driving arrests remain dominated by men. In 1998, 676,911 men were arrested for being under the influence, compared with 626,371 arrests in 2007. More than 126,000 women were arrested for DUI in 1998, a number that increased to 162,493 in 2007. Laura Dean-Mooney, president of Mothers Against Drunk Driving, said it was unclear why there has been an increase in the number of women arrested for impaired driving. “There’s no hard data on that. What you’re hearing more is that women are under more pressure, they’re now perhaps the breadwinner because of the unemployment rate,” she said. “We need to make sure women understand that if you’re a drinking driver, you’re just as likely as a male to hit or kill or injure someone or perhaps even kill yourself, as we saw in the horrible Taconic Parkway crash,” she said. Statistics also show that women are more likely than men to have passengers including young children in the vehicle when arrested for DUI. Transportation officials said the number of impaired women involved in a fatal crash increased in 10 states from 2007 to 2008. The states are: Ohio, New Hampshire, Montana, Nevada, Wyoming, West Virginia, Indiana, Washington State, Kansas and Tennessee. With the upcoming Labor Day holiday a time for a nationwide increased drunk driving enforcement campaigns, officials released the information in a concerted effort to curb drinking and driving over the long weekend. 11,000 police departments and law enforcement agencies across the country will be aggressively stepping up drunk driving enforcement through the Labor Day weekend. “With the long Labor Day weekend approaching, our department will be continuing our aggressive enforcement of drunk driving laws”, says Lee County Sheriff Mike Scott. “This is traditionally a period of increased offenses by both men and women, and it is our intention to make every effort to keep Lee County’s roadways safe for all drivers.” Over the Labor Day weekend last year almost half of the fatal crashes nationally involved a drunk driver. Drunk driving is a serious problem in Southwest Florida and throughout the country. 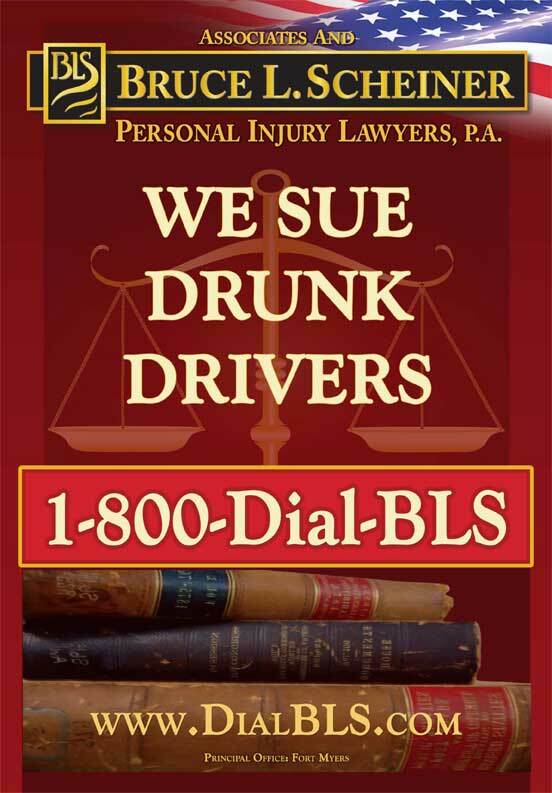 Associates and Bruce L. Scheiner Personal Injury Lawyers sue drunk drivers and are focused on justice for those who may have been seriously injured or killed in an alcohol-related accident. 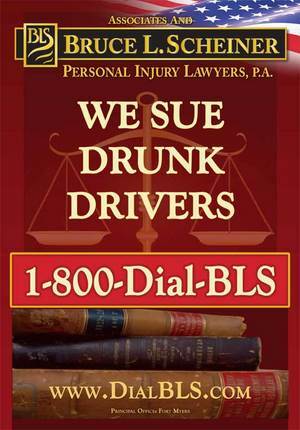 Call 1-800-DIAL-BLS to speak to one of our attorneys today, and learn how we can help you attain the compensation you deserve.